This Sunday, November 13th, The Royal British Legion will stage its annual Remembrance Day Parade in Limpsfield. The colourful parade, by local armed forces, veterans and cadets will commence at 9.30am from Sylvan Close to St Peter’s Church, where there will be a Remembrance service at 10am. A return parade will follow after the service. 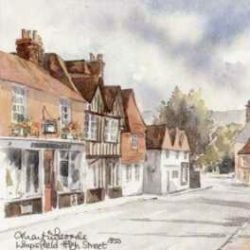 Don’t forget, Limpsfield High Street is blocked for traffic at this time with no road traffic allowed from the Limpsfield traffic Lights to Detillens Lane roundabout from 9am to 11.30am. This year, The Royal British Legion is asking the nation to Rethink Remembrance by recognising the sacrifices made not just by the Armed Forces of the past, but by a new generation of current veterans and their families, who also need our support. The annual poppy appeal helps to support the vital work done for the Armed Forces community. Wearing a poppy is a symbol of Remembrance: to remember the fallen Service men and women killed in conflict. Remembrance events, such as Remembrance Sunday and Armistice Day are held during the month of November to commemorate the fallen. Buy your poppy from the local sellers or make a donation HERE. Lest We Forget: Please don’t forget told a minute’s silence on Friday 11 November 2016 at 11AM.